Archana is using Smore newsletters to spread the word online. - FDR was born on January 30, 1882 in Hyde Park, NY. - Social Darwinism and Robber Barrons were representative of the Gilded Age. - FDR grew up in a wealthy family and lived a "privileged, carefree environment of comfort and security." - FDR's tutor Jeanna Rosat-Sandoz drilled FDR in a variety of modern languages and instilled in him a sense of social responsibility. She believed in economic reform and the Social Gospel movement and encouraged FDR to adopt her opinions. "I often thought it was you, more than anyone else, who laid the foundation for my education." 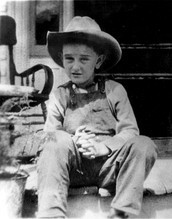 - Since he was an only child who lived in a rural estate, FDR spent most of his time around adults and had few friends. - His Episcopalian faith as the source of his optimism and confidence. - He was a very gifted child, and read and retained facts very easily. - Groton's puropse: to cultivate manly Christian character having regard to moral as well as intellectual development. - FDR gained admittance into Harvard University in1900 along with 16/18 of his classmates. The crown of his career at Harvard was his position as edition of the Harvard Crimson. 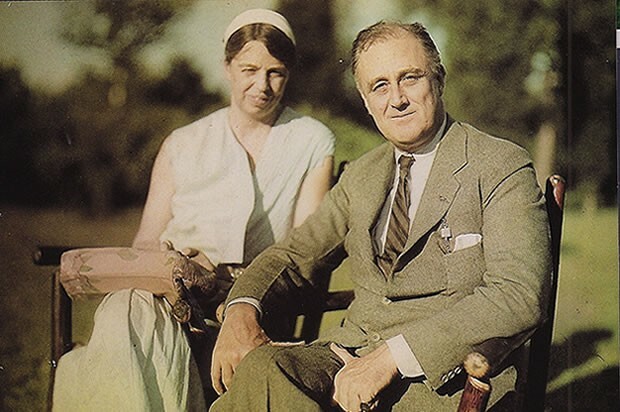 - FDR married Eleanor Roosevelt - his 5th cousin once removed, orphaned darter of his godfather. - He was a law student in Columbia University. He had 73 absences in his first year and failed 2/7 courses. Altogether, he received 3 Bs, 3 Cs, and 1 D (middle of his class). Although he easily passed the bar and was offered a job, he dropped his courses and never took a degree there. - FDR wasn't very likable - his colleagues found him insufferable and socially indifferent. - He was appointed assistant secretary of the Navy - helped expand it and ensure safe passage of Navy's a Cruiser and Transport Force across the Atlantic. Because of FDR's achievements, the Navy could proudly say that it had lost no American troopships in action. "See young Roosevelt about it." - FDR and Eleanor grew distant during the WWII years and after their 6th child, never had anything more than a legal material relationship. - Lucy Mercer was hired by ER to help with correspondence and she soon began an affair with FDR, but Eleanor was unwilling to step aside for FDR and Lucy because of a Roman Catholic annulment. - One day, FDR felt fatigued but by the next evening, he couldn't stand or move his legs. He was soon aching and paralyzed from the chest down. Only the third doctor, Louis Howe, was able to correctly diagnose FDR with poliomyelitis. - He was elected Governor of NY from 1929 - 1932. - FDR was in his second term as governor when he was elected as the 32nd President in 1932. -Since the country was drowning in the Great Depression, FDR first goal was to restore Americans' confidence in their country. He proclaimed a national Bank Holiday 2 days after his oath to office. All banking transactions were halted except for the making of change. Also presented this time, the Emergency Banking Act allowed FDR to reopen banks that were solvent and assist banks that were not. 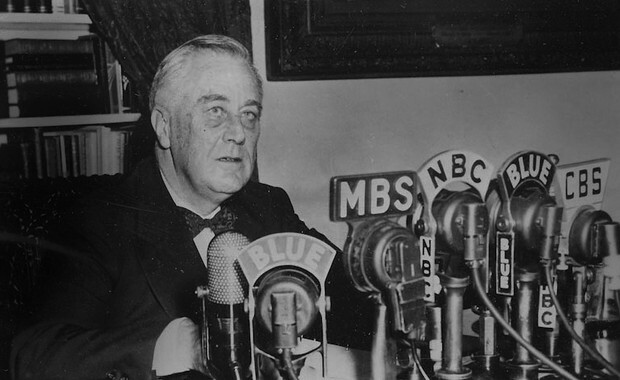 - FDR spoke to the nation via "fireside chats," which were honest and placating. Americans thought of him as "a public man going to the country." "Capitalism was saved in eight days." - FDR tackled 3 of the most powerful apical interests in the country: veterans (economy bill), temperance (beer bill), and organized labor (CCC). - He took the U.S. off the gold standard after much deliberation. - He had a very routined schedule. - He enjoyed poker and fishing, and worked on his stamp collection every evening. - FDR swam with the isolationist tide - he agreed to the passage of neutrality acts. - He believed that Hitler could be contained through airpower. - Germany's nonaggression pact threw out the neutrality acts. FDR tried to repeal them, but Congress didn't comply easily. - Churchill asked FDR for assistance immediately after he replaced Chamberlain as PM of Britain; FDR acquiesced by providing a certain degree of air power. - His "Stab in the Back" Speech Marked a decisive turning point in American policy (FDR unequivocally allied himself with Great Britain and France). He used the speech to argue against isolationism on the part of the American people. "Some indeed still hold to the now somewhat obvious delusion that we of the United States can safely permit the United States to become a lone island, a lone island in a world dominated by the philosophy of force (AUDIENCE)… Such an island may be the dream of those who still talk and vote as isolationists. Such an island represents to me and to the overwhelming majority of Americans today a helpless nightmare of a people without freedom—the nightmare of a people lodged in prison, handcuffed, hungry, and fed through the bars from day to day by the contemptuous, unpitying masters of other continents (SUBJECT)." - American relations with Japan had been deteriorating since President Grant. - FDR put a limited embargo in place, which only angered the Japanese. He then proceeded to freeze all Japanese assists in the the U.S.
- Pearl Harbor bombing was "a date which will live in infamy." - Operation OVERLORD was discussed amongst the Big Three. - After Germany, Japan, and Italy unconditionally surrendered, the war was over. "If anything happened to that man, I couldn't stand it. He is the truest friend; he has the farthest vision; he is the greatest man I have ever known." 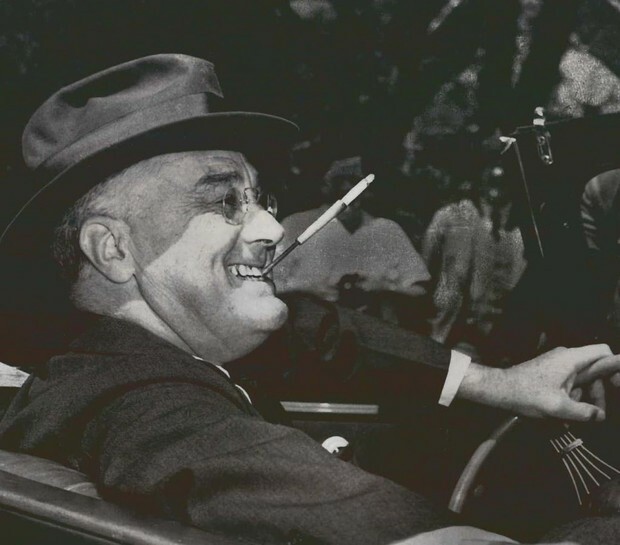 - Roosevelt's health progressively declined in 1944 - he was hypertensive (186/108), cyanotic, had extreme cardiomegaly, and was constantly fatigued and running a fever - FDR was dying from congestive heart failure. - FDR still had post-war obligations, such as deciding the occupation of Germany, Poland, and Russia. - One day, FDR was sitting at his desk and felt a sharp, jolting pain in the back of his head. He slumped forward and died. "No president… had a sharper sense of personal power, a sense of what it is and where it comes from; none has had more hunger for it, few have had more use for it, and only one or two could match his faith in his competence to use it." - FDR would be successful in the 1980s, because he was similar to Ronald Reagan. - Just as Reagan came into his Presidency as a popular Hollywood actor, FDR entered the political area from a privileged, aristocratic background. However, they both appealed to the common people in times when it was essential to regain public support and confidence. - During the 1980s, America was in need of a strong economic policy as its backbone - just as Reagan instituted Reaganomics, FDR instituted the New Deal. Both their contributions helped pull the nation out of economic disaster. - Even in the 1980s, FDR would be admired, but maybe to a lesser extent, because he was more liberal while Reagan was more conservative. - If I had the same skills as FDR, I would get the American public to have more faith in the government nowadays, despite Congress approval ratings. - I would also try to ease the losses associated with unemployment (like FDR did with the CWA) , but emphasize on dealing with the stipulations of COBRA so that more people have the opportunity to be insured. - Because FDR didn't have many friends as a child and was considered "weaker" because of his health issues, he often felt insecure as president and didn't want anyone to know of his erosional struggles when he was President. 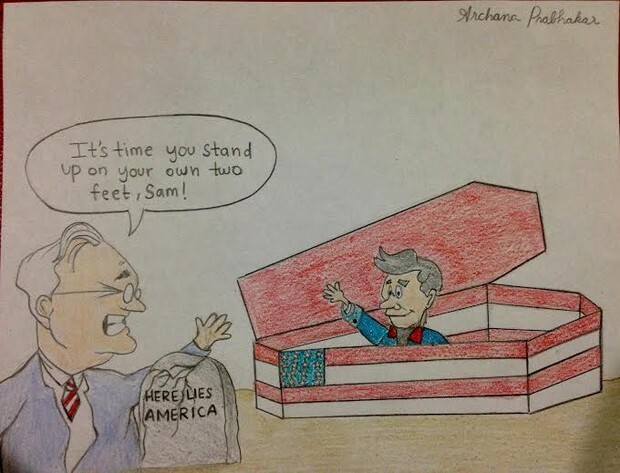 "FDR: Pulling America out of its wheelchair." "FDR at 100: Still a Controversial Figure"
This USA today article describes FDR as the world’s most controversial President, both loved and hated across the country. FDR was so influential that he was able to drag the US out of a nationwide economic slump that had just exacerbated over the years following the Great Depression. With the hopes of winning World War II, FDR took a risk in transforming an isolationist nation into a country directly involved in world affairs (PERIODIC SENTENCE). He is even regarded as one of the Big Three leaders. However, the author of this article also points out some discrepancies within his Presidency to contrast the abundance of sources that claim FDR only did good for his country. Many aristocrats believed that he turned against his class and ignored them as he worked tirelessly for laborers in the working class, and many African Americans were disapproving of FDRs policies that were non-inclusive of blacks. Overall, FDR is cited as a great and influential preisdent, having inspired future leaders such as LBJ and Ronald Reagan. Roosevelt was profoundly successful in using the federal government to improve the livelihood of the American people as well as tackling the military giant that was World War II. Driven by the immediate need to reverse the depression, FDR was able to quickly pass effective policies that eventually formed the iconic New Deal (PARTICIPIAL PHRASE). Despite harping on a few of FDR’s imperfections, it is clear that the author, along with the majority of people, believed that FDR positively impacted the United States. "First Mothers: The Women Who Shaped the Presidents (Book Review)." Anne Caroline Drake. N.p., 29 July 2011. Web. 21 Apr 2015. "History of the FDR Library and Museum." Franklin D. Roosevelt Presidential Library and Museum. N.p., n.d. Web. 21 Apr 2015. "Miller Center." “Stab in the Back” Speech (June 10, 1940)-. N.p., n.d. Web. 21 Apr 2015. Smith, Jean Edward. FDR. New York: Random House, 2007. Print. "10 Things You May Not Know About the Roosevelts." History.com. A&E Television Networks, 20 Dec. 2012. Web. 21 Apr 2015. "What Was the President Smoking?" Mother Jones. N.p., n.d. Web. 21 Apr 2015.